VARENA, Lithuania (AP) — Hundreds of Lithuanians ran around with baskets and buckets Saturday in a southeastern pine forest. Why you ask? It’s the national championship of wild mushroom picking — a competition always held on the last Saturday in September. That’s when conditions are “not too dry, not too wet, the humidity is perfect,” explained mushroom hunter Janina Juodine. 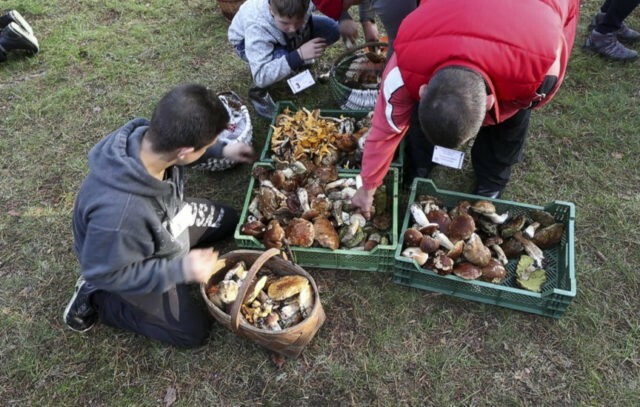 A rainy, relatively warm summer created ideal conditions for the foraging festival in Lithuania, where forests cover more than 33 percent of the Baltic country and mushroom-hunting is considered the second-most popular sport after basketball. Mushrooms — fresh, dried, salted or marinated — are considered an essential element in Lithuanian cuisine, used in many dishes to add special flavor to meat, fish and potatoes. More than four hundred edible varieties can be found in Lithuania’s forests, including edible boletus, slippery jacks, chanterelles, blewits and morels. The festival Saturday took place 60 kilometers (37 miles) south of the capital, Vilnius, close to the border with Belarus. It drew thousands of onlookers as well as local mushroom sellers dressed in Lithuanian folk costumes — colorful knee-long skirts with embroidered aprons and woven sashes. “This is a great event,” contest judge Rimute Avizininene told The Associated Press. She said 21 teams had participated, adding that the largest picked edible boletus — known in the country as the king of Lithuania’s forests — weighed 621 grams (22 ounces). A local team called Mushroom Nightmares won Saturday’s contest by delivering 58 kilograms (128 pounds) of mushrooms.